You will need Create React App installed on your machine. In a previous article, we introduced React Hooks and looked at some ways to use the useState() and useEffect() methods. If you aren’t already familiar with these methods and their uses, please refer to this article. To follow along with this tutorial, you’ll need the following tool create-react-app installed. 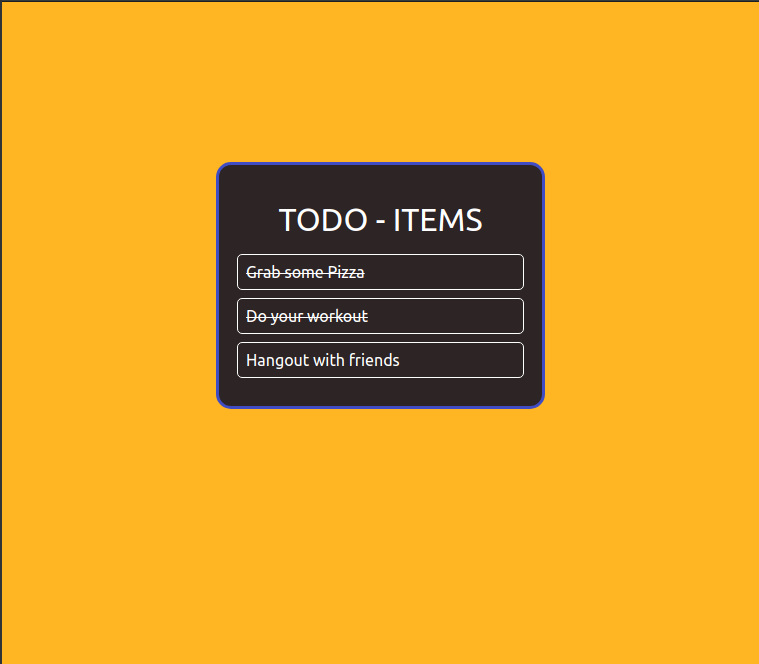 Todo.js - This is where all of our functional components will go. Todo.css - This is where the styles for the application will go. At the beginning of this snippet, we pulled in useState from the React library because we need it to manage the state within our functional components. Next, the Task component returns some JSX to define what each task element will look like. We finally return some JSX within the Todo component and nest the Task component. We get three hard-coded tasks, two of which are complete and one that isn’t. In the next section, we will work towards making the application interactive and able to receive input from the user. Using useState, this component registers a state — value — and a function for updating it — setValue. The handleSubmit handler will prevent the default action that would normally be taken on the form and add a new Task using the latest value that is in the input field. Now we have a nice input box where we can put in new values to create new tasks for the Todo application. At this point, we need to be able to indicate that we have completed a task. Our tasks object in the Todo component already makes that possible as there is a completed key-value pair. What we need now is an interactive way for the user to set a task as completed without hard-coding the data. Now we can click on a complete button to indicate that we have finished executing a task! Another wonderful feature to include to the Todo application is an option to completely remove a task whether it has been completed or not. We can do this in similar steps like the ones we used in creating the complete feature. Great, we have a fully functional Todo application that is built off functional components only. We will add an additional feature in the next section. In this section, we will use the useEffect state Hook to update the number of pending tasks whenever the DOM is re-rendered. You can learn more about the useEffect hook here. In this tutorial, we have learned how we can create a simple todo application using React Hooks. Hooks are a very welcome feature to React and it allows new levels of modularization that was not previously possible in React. The source code to the application built in this article is on GitHub.